Oswego City Police and University Police teamed up recently to go door to door to educate students about the consequences of disruptive behavior and unhealthy decision making as the end of the spring semester approaches. From left are: Oswego police officer Justin D’Elia, SUNY Oswego student Sarah Beginski, SUNY Oswego student Tia Bullard, Student Association president Christopher Collins-McNeil, and University Police Officer Thomas Marrone. This unsanctioned, event in the city of Oswego was the source of many areas of concern, ranging from disruptive behavior to dangerous and unhealthy decision making, according to Mayor Tom Gillen. 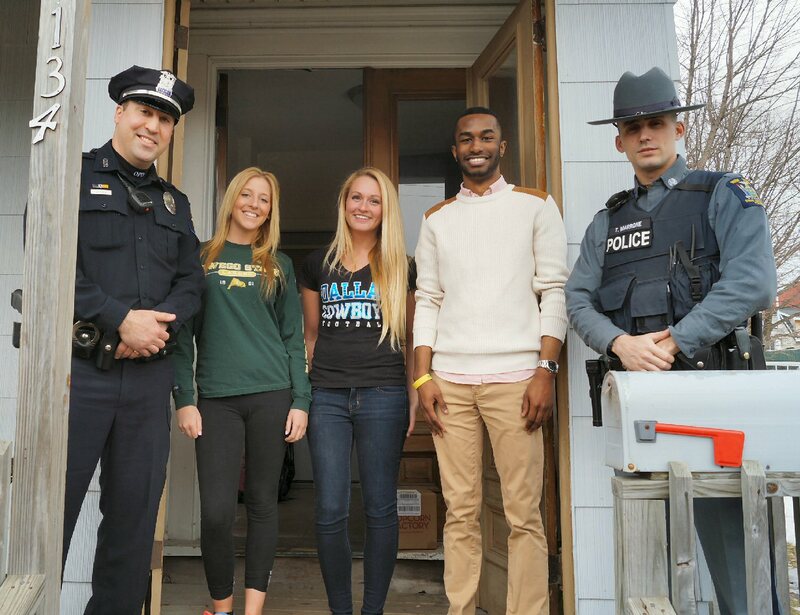 Continuing through the end of the spring semester, Oswego City Police and University Police will be going door to door in neighborhoods with a high density of college residents to discuss the consequences of poor decision making and disruptive behavior. • Don’t have large, unmanageable, loud parties, especially when neighbors are trying to sleep. • Keep your apartment / home and your yard clean and free of debris. • Maintain and follow the correct procedure for trash / recyclable goods. • Be friendly and considerate of your neighbors. • Be aware of the parking needs of neighbors and all of the applicable restrictions throughout the city. Last year, the Oswego Common Council voted unanimously to “ban” the Bridge Street Run. In addition to the community outreach efforts, leading up to the SUNY Oswego Ozfest event in May, the Oswego City Police Department will be visiting local establishments that are engaged in the sales of alcohol to highlight some of the state and local laws regarding alcohol licensees and their legal responsibilities. Oswego Police will be offering to provide one-on-one question and answer sessions with each of the business owners and/or staff and will provide reference material made available through the New York State Liquor Authority regarding the local and state regulations. The information that will be provided is intended to assist in improving upon already successful strategies employed by most Oswego businesses. Oswego Police wish to remind residents, students, visitors and guests of the city of Oswego that in anticipation of a large influx of people gathering in and around the city of Oswego for the upcoming SUNY Oswego Ozfest, the Oswego City Police Department will have extra officers on duty being supplemented by law enforcement officers from outside agencies. The officers will be assigned to various details including marked and unmarked police vehicle patrol, foot patrol, ATV patrols and dedicated neighborhood patrols specifically assigned to target loud or disruptive parties.